November 17th, 2011 | Author: Matthew D. Weidner, Esq. This really is extraordinary. An Attorney General brings a HUGE indictment against two individuals…but here’s why it is so earth-shattering…..read carefully the crimes that are alleged….then understand that these same acts were probably performed all across this country hundreds of thousands of times. The conundrum created by an announcement such as this is once it’s done once by one Attorney General, what are all the other Attorney’s General and enforcement agencies to do? Shall they just ignore what their counterpart is alleging? Are they able to just sit on the sidelines and ignore the serious allegations of systemic violations knowing full well that it was/is happening in their states as well? And what about states like North Carolina and Massachusetts where elected public officials like Jeff Thigpen and John O’Brien have been screaming bloody hell for years, demanding that something be done? Paralegal; CA Licensed Real Estate Broker; Certified Forensic Loan Analyst. Litigation Support; Mortgage and Real Estate Expert Witness Services. EDITOR’S NOTE: The race is on — who is going to be the first attorney general to bring the major banks to their knees begging for amnesty instead of demanding it because they are too big to fail? Any politician with future ambitions had better not be cozy with Banks or even favor leniency. If there is a bailout, it had better be to John Q Public. Information is sought on the mortgage giants’ roles as landlords who own thousands of foreclosed properties in California. Also sought are details of their mortgage-servicing and home-repossession practices, a source says. Many homeowners who lost their homes over the past few years are wondering what the robo-signing scandal means for them. Steve Gottheim, ALTA’s Legislative Counsel, tells a reporter at NBC News that homeowners who purchased a house at a foreclosure sale should have obtained an Owner’s Title Insurance Policy. may be found at Questions for Homeowners in Foreclosure Scandal, NBC News | November 17, 2011. April got quite a few emails asking for the authority for the above statement. The below email and attachments are the response to all these emails. Please read the depos and the applicable mers membership rules. Neither MERS nor merscorp ever performed the corporate actions or gave authority or documentation needed to give the mers VP Bill Hultman the corp authority to appoint a single signer; the signers were required to be officers of the mers member corp; the signer had to be appointed in their official capacity, not personal, and mers’ signers would only have the power that the principal had (as mers is only a nominee), the principal being the originating lender who was contractually bound to execute the docs required by the psa only and exclusively within the start up term of the trust. And there is no capacity or authority for any of the signer activity that we are dealing with, surrogate or otherwise, after the closing date of each REMIC trust. EDITORIAL NOTE: With a few places as an exception, home prices, once predicted as bottoming out LAST YEAR, continue to drop and are expected to take another plunge of 15%-20%. Experts who once predicted the bottom in 2010 are now saying it will be sometime in 2012. 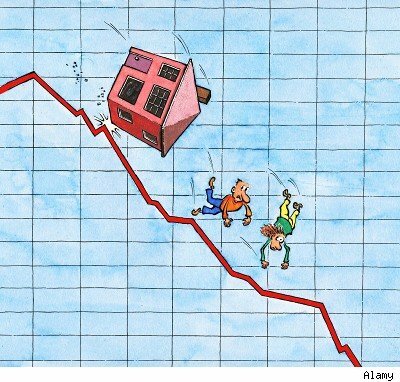 Here is what I say: home prices will continue to drop and could even go to near zero because of the rise of title problems caused by exotic Wall Street scenarios in which the title to most properties were affected. As for when they hit “bottom” it will be when the foreclosure nightmare is over. Even the optimistic experts concede that is, on average, another 8 years, with New York topping the list at 57 years. He’ll need to come to the table with money in order to sell and he knows that whoever he pays is probably not entitled to the money. he just wants out of a neighborhood that is a virtual ghost town. What was once a thriving community is bereft of the family, secure atmosphere on the brochures. WASHINGTON — Home prices dropped in nearly three quarters of U.S. cities over the summer, dragged down by a decline in buyer interest and a high number of foreclosures. The National Association of Realtors said Wednesday that the median price for previously occupied homes fell in the July-September quarter in 111 out of 150 metropolitan areas tracked by the group. Prices are compared with the same quarter from the previous year. Fourteen cities had double-digit declines. The median price in Mobile, Ala. dropped 17.7 percent, the largest of all declines. Phoenix and Allentown, Pa., Atlanta, Las Vegas and Miami also experienced steep declines. Eight cities saw double-digit price increases. The largest was in Grand Rapids, Mich., where the median price rose 23.7 percent. South Bend, Ind., Palm Bay, Fla., and Youngstown, Ohio, also saw large price increases. The national median home price was $169,500 in the third quarter, down 4.7 percent from the same period last year. Most analysts say that prices will sink further because unemployment remains high and millions of foreclosures are expected to come onto the market over the next few years. Sales of previously occupied homes dropped to a seasonally adjusted annual rate of 4.88 million in the third quarter, slightly ahead of last year’s pace for the same period. Sales were lower than usual for the summer season last year because a federal tax credit inspired more buying in the spring. This year, sales are on pace to finish behind last year’s total, which was the lowest in 13 years. Sales are low even though the average rate on the 30-year fixed mortgages is hovering near 4 percent. Regionally, the median home price in the Midwest fell 2.2 percent to $142,300 in the quarter from the year before, even as sales activity jumped 25 percent. In the South, the median price also slid 2.2 percent to $153,200 and home sales increased 15.5 percent. The Northeast’s median home price dipped 6.5 percent during the period to $236,700, as sales rose from the previous year by 11.6 percent. The median home price in the West dropped by 9 percent to $205,700 in the third quarter from a year ago. Sales there increased 16.7 percent. Using the Courts to Fight a California or Other Non-Judicial Foreclosure – 3-Stage Analysis – including a Homeowner Action to “Foreclose” on the Bank’s Mortgage Security Interest – rev. California real property foreclosures are totally different from foreclosures in New York and many other states. The reason is that more than 99% of the California foreclosures take place without a court action, in a proceeding called a “non-judicial foreclosure”. Twenty-one states do not have a non-judicial foreclosure. [These states are CT, DE, FL, IL, IN, KS, KY, LA, ME, MD, MA, NE, NJ, NM, NY, ND, OH, PA, SC, UT, VT. – Source: realtytrac.com] In California, the lending institution can go through a non-judicial foreclosure in about 4 months from the date of the filing and recording of a “Notice of Default”, ending in a sale of the property without any court getting involved. The California homeowner can stop the sale by making full payment of all alleged arrears no later than 5 days prior to the scheduled sale. Unlike a judicial foreclosure, the homeowner will have no right to redeem the property after the sale (“equity of redemption”, usually a one-year period after judicial foreclosure and sale). For a visual presentation of the timeline for California and other state non-judicial foreclosures, go to Visual Timeline for California Non-Judicial Foreclosures. The problem I am going to analyze and discuss is under what circumstances can a homeowner/mortgagor go into court to obtain some type of judicial relief for wrongful or illegal conduct by the lender or others relating to the property and mortgage. My discussion applies as to all states in which non-judicial foreclosures are permitted. As long as a homeowner keeps making the mortgage payments, and cures any occasional short-term default, the homeowner is in a position to commence an action in federal or state court for various types of relief relating to the mortgage and the obligations thereunder. One typical claim is a declaratory judgment action to declare that the mortgage and note are invalid or that the terms are not properly set forth. There are various other types of claims, as well. The filing of such an action would not precipitate a non-judicial foreclosure. Compare this to a regular foreclosure, in which the homeowner stops paying on the mortgage, gets sued in a foreclosure action, and then is able in the lawsuit to raise the issues (as “defenses”) which the California homeowner would raise as “claims” or “causes of action” in the lawsuit being discussed for this first stage. This is the most difficult of the three stages for making use of the courts to oppose foreclosure. 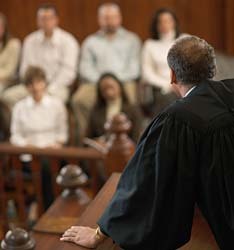 The reasons are: foreclosure and sale is apt to take place too quickly; the cost of seeking extraordinary (injunctive) relief is higher because of the litigation papers and hearing that have to be done in a very short period of time to obtain fast TRO and preliminary injunctive relief to stop the threatened sale; the cost of this expensive type of injunctive litigation is probably much higher for many homeowners than just keeping up the mortgage payments; and, finally, you would have to show a greater probability of success on the merits of the action than you would need to file a lawsuit as in Stage 1, so that the homeowner’s chances of prevailing (and getting the requested injunction) are low and the costs and risks are high. Nevertheless, when the facts are in the homeowner’s favor, the homeowner should consider bringing his plight to the attention of the court, to obtain relief from oppressive lending procedures. The problem with most borrower-homeowners is that they do not have any idea what valid bases they may have to seek this kind of relief. What anyone should do in this case is talk with a competent lawyer as soon as possible, to prevent any further delay from causing you to lose an opportunity to fight back. You need to weigh the cost of commencing a court proceeding (which could be $5,000 more or less to commence) against the loss of the home through non-judicial foreclosure. If the property has already been sold, you still have the right to pursue your claims, but in the context of a “wrongful foreclosure” lawsuit, which has various legal underpinnings including tort, breach of contract and statute. This type of suit could not precipitate any foreclosure and sale of the property because the foreclosure and sale have already taken place. Your remedy would probably be monetary damages, which you would have to prove. You should commence the action as soon as possible after the wrongful foreclosure and sale, and particularly within a period of less than one year from the sale. The reason is that some of your claims could be barred by a short, 1-year statute of limitations. If you would like to talk about any possible claims relating to your mortgage transaction, please give me a call. There are various federal and state statutes and court decisions to consider, with some claims being substantially better than others. I am available to draft a complaint in any of the 3 stages for review by your local attorney, and to be counsel on a California or other-state action “pro hac vice” (i.e., for the one case) when associating with a local lawyer.